I have always had a soft spot for Valentine Warner. Ever since he arrived on our screens in 2008 with his series What to Eat Now I was completely drawn in by his evident passion for food and sheer over exuberance in the kitchen; he was like an excitable puppy and I wanted to cook just like him. Imagine therefore my joy when I discovered that the cottage we had recently bought was next door to a house owned by Lady Warner, Val’s mother. Before alarm bells start going off, I only discovered this 6 months after we moved in. However it did instill a little bit of the nosey neighbour in me, and I would often run to the window whenever a new car pulled into the driveway, in the hope of catching a glimpse of his curly mop of brown hair. I was never fortunate enough to meet the great man himself. The closest I came was when I popped up from behind the bordering hedge one day to shout, ‘HELLO THERE’, in his face. His startled expression and look of slight terror said it all and sadly the friendship I so desperately wanted to garner never blossomed. His mother moved away shortly after that episode – I like to think I was in no way responsible for her decision. Anyway enough about that, lets talk about the cook books. I have three of his books on my shelf: What to Eat Now, What to Eat Now – More Please! and The Good Table. Each book is full of mouth watering recipes that utilise ingredients that we may not be so familiar cooking with: grouse, guinea fowl, rabbit and clams are but a few examples. There is also a fairly good balance of vegetarian to meat dishes so there is enough to keep everyone happy. The narrative he uses to describe each recipe is insightful, amusing and easy to follow. Sometimes it’s hard to know if you’re following a cookery book or reading an auto biography – it really is a delight. 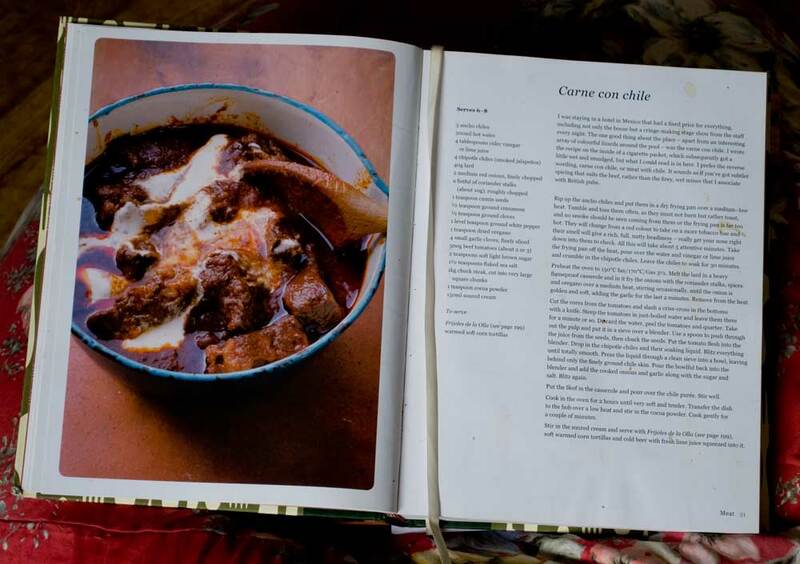 Let me now share with you some of my favourite recipes, the first being Carne con chile from The Good Table. You can probably tell from the photograph above that this is a much loved and well thumbed recipe (the chilli stains on the pages say it all). This recipe uses whole chunks of beef instead of the mince we so often see associated with a chilli con carne and boy does it make a difference. It requires a slow cook so I often put this on before heading out for a country walk on a crisp autumnal day and look forward to it’s generous warmth on the return. Another favourite from the same book and such a simple dish to make is the Boiled new potatoes with Stinking Bishop & spring onions. Yes it may make your kitchen smell like old socks for a while but the taste is well worth the sacrifice. A couple now from What to Eat Now – More Please! ; these are real summer pleasers. Trout with samphire and beurre blanc and Potato salad with quails eggs, capers and anchovies. I’m not suggesting you serve both at the same time but they are just sublime – perfect with a cold, crisp glass of chablis. Has to be eaten al fresco! And finally, taking you back to where it all started What to Eat Now. The first time I ever cooked with venison was Val’s Venison pie, it was a bit of a revelation and I’ve never looked back. To finish; Apple charlotte with stem ginger. So few ingredients but such a delicious pud, I could polish off a good 2 or 3 of these in one sitting! So there you have it – Val’s cookbooks. Most are now only available 2nd hand on amazon (I’ve provided the links) so you can get them at a steal. Just don’t try stalking the poor man like I did!